Laurel Burch had children from her first husband. They include her daughter, who was named Aarin and her son was Jay. This was when Laurel and her husband were street musicians in the San Francisco area. This was a short lived romance that ended with Laurel being a single mother on welfare at the age of 20. After Aarin was born, Laurel was advised by her doctor not to conceive another child. The doctor was worried about her pelvis and the stress that having another child would put on it. In order to have her children Laurel had to wear a brace to help support her pelvis and keep it from splintering. Laurel Burch had a love of life and ignored her doctor’s advice. Being in a strange town with no family at the age of 20 is hard enough. She then also had to support two infant children and deal with her crippling bone disease as well. While welfare did help, this was a time before food stamps. It was not in Laurel’s character to just sit back and admit that life had gotten the better of her. One of Laurel’s strong characteristic traits was her natural charm and sense of making people happy when they were down. This began when she was a child being laid up in the hospital wards with other children. She would take what was near her and create a simple piece of art. This cheered the other children up and helped them to find the secret happy place inside of themselves. This same trait was still with Laurel when she was a single mother. To help keep herself busy she would take pieces of scrap wire, metal, bones, old coins and buttons she would find lying around in the streets and craft them into jewelry. She was able to do with a pair of pliers, a hammer and the back of a frying pan. At first she would just give them away to help others be happy. Eventually she realized this jewelry she was making could still bring happiness to others while helping her to support her children. She began as a professional jewelry maker by sitting on street corners and selling her wares out of an old fishing tackle box. In time the local stores took notice of her and began to place her jewelry in them. This helped Laurel Burch considerable since she could now spend more time with her children at home instead of on the streets. This support and income from the selling of the jewelry eventual helped Laurel to get her and her children off of welfare. Eventually Laurel Burch succumbed to her bone disease and passed away at the age of 61 but her legand lives on. 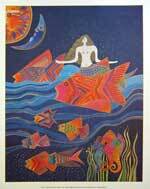 The Laurel Burch Artworks Inc is now run by Jay, her son. He is still granting license to vendors that wish to produce and sell Laurel Burch products. Aarin today is a successful film producer and runs her own film company. One of the films that are being produces is the Life of Laurel Burch. It will become available in the next few years.